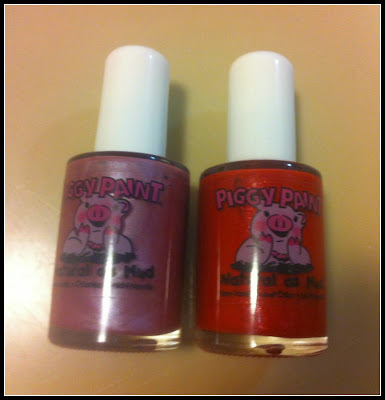 These are the words my daughter says when she a) sees a bottle of Piggy Paint, b) extends her foot for a pedicure and c) the morning after when she checks out her toes. The hardest part of applying Piggy Paint is trying to get her to stay still. She's awed by how I apply the nail polish with the brush, (and I securely hold her foot while doing so) but once it's done she wants to walk around and play before it dries completely (and it dries quite quickly, which tells you how many bees my toddler has in her bonnet). The best parts of Piggy Paint for me are that it doesn't smell and it's easy to clean if she happens to get it on anything while her nails are drying. The polish lasts on her feet a few days, big toes for longer. At this age, I think it's more the act of Mommy applying the polish she enjoys versus having the pretty toes for a week (although she will make other people take notice of them for at least the first 36 hours). How old was your child the first time they had their nails painted? Disclosure: I received Piggy Paint from Nail Polish Canada for the purpose of this review. OMG I want this!! My DD loves looking at my toes and fingers when they're all polished up. She will go crazy for this.